In England as elsewhere, policy makers are trying to reduce the pressure on costs due to rising hospital admissions by encouraging GPs to refer fewer patients to hospital specialists. This could have an impact on elective treatment levels, particularly procedures for conditions which are not life-threatening and can be delayed or perhaps withheld entirely. 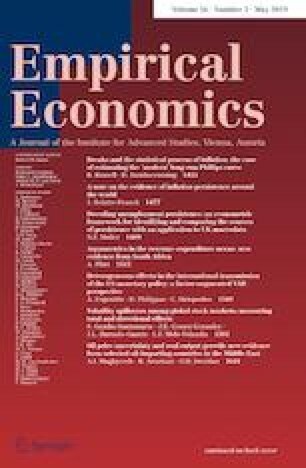 This study attempts to determine whether cost savings in one area of publicly funded health care may lead to the increases in cost in another and therefore have unintended consequences by offsetting the cost-saving benefits anticipated by policy makers. Using administrative data from Hospital Episode Statistics in England, we estimate dynamic fixed effects panel data models for emergency admissions at Primary Care Trust and Hospital Trust levels for the years 2004–2013, controlling for a group of area-specific characteristics and other secondary care variables. We find a negative link between current levels of elective care and future levels of emergency treatment. This observation comes from a time of growing admissions, and there is no guarantee that the link between emergency and elective activity will persist if policy is effective in reducing levels of elective treatment, but our results suggest that the cost-saving benefits to the NHS from reducing elective treatment are reduced by between 5.6 and 15.5% in aggregate as a consequence of increased emergency activity. The views and opinions expressed therein are those of the authors and do not necessarily reflect those of the NIHR Health Services and Delivery Research, NIHR, NHS or the Department of Health. Successive Labour Governments funded exceptional growth in UK health spending at an average of 6.4% per annum between 1996/1997 and 2009/2010 and while growth has slowed in more recent years (IFS 2015), publicly funded health-care spending in England has, on the whole, been protected from recent austerity measures that have affected most Government departments. However, the National Health Service (NHS) is expected to improve efficiency and to avoid over-spending, as the NHS planning document “Everyone Counts: Planning for Patients 2013/2014” explains. This includes pressure on spending in hospitals, and incentives to encourage GPs to refer fewer patients for specialist hospital care, both of which could impact on elective treatment levels, as procedures can be delayed or perhaps withheld entirely. Our concern is that restricting elective care could lead to an increase in emergency activity as patients seek withheld treatment in other settings. In particular, this study attempts to determine whether cost savings in one area of publicly funded health care may lead to the increases in cost in another and therefore have unintended consequences by offsetting the cost-saving benefits anticipated by policy makers. A specific policy concern is that if emergency care increases when elective care is reduced, cost savings achieved by the NHS might not be as significant as the recent efficiency-pursuing policies intend. Previous studies have looked at the choices doctors face when there are short-term limits on the number of hospital beds available for patient admissions. For example, where “bed-blocking” occurs (e.g. Black and Pearson 2002; Jasinarachchi et al. 2009; Godden et al. 2009), and patients are forced to remain in hospital beds not necessary for their recovery due to a lack of more suitable facilities, or where patients need to be admitted from Accident and Emergency departments (A&E) to meet waiting time targets (e.g. Proudlove et al. 2003). In these situations, it is common for elective admissions to be postponed or cancelled in preference to more urgent emergency admissions. Robb et al. (2004) and Nasr et al. (2004) study the impact of prioritising emergency operations and admissions over planned procedures. They note that this practice has cost implications and can cause distress and huge inconvenience to the affected patients. Another section of the literature focuses on conditions for which an elective procedure directly impacts on the requirement for future emergency treatment. For example Simianu et al. (2016) look at the impact of elective colon resection on rates of emergency surgery for diverticulitis. In this particular case, higher rates of elective treatment do not reduce the future requirement for emergency care, but this result may not generalise across all conditions. Morgan et al. (2013) perform a systematic review of the literature on interventions used to reduce emergency department utilisation. Of the studies they found that considered increased health-care provision in other settings, four noted statistically significant reductions in emergency care as a result. They also noted that savings ranged from 10 to 20% in three studies that reported cost implications. However, the relationship between emergency and elective treatment levels when there are changes to hospital resources has not been widely studied. As we demonstrate in Sect. 2, it is not clear whether emergency and elective treatment levels will move in the same direction or in opposite directions in response to changes in capacity. In this paper, we add to the literature by providing an estimate of the consequences on emergency activity in the NHS in aggregate when elective provision is changed. In the decade to 2011/2012, hospital admissions in England increased by 35.4% (HSCIC 2012). Similar growth occurred in both emergency and elective care, with 1.3 m (34.6%) extra emergency admissions and 2.6 m (35.7%) extra elective admissions.1 Several explanations have been proposed for the growth in hospital admissions. They include an increase in illness and frailty linked to the ageing population (Blatchford and Capewell 1997; Sharkey and Gillam 2010; Thompson and Poteliakhoff 2011); increased ability to detect and treat illness (Hobbs 1996); the effects of changing incentives in the recently introduced framework of paying hospitals via a tariff instead of with block grants (Farrar et al. 2009; Information Centre 2010); the opening of the market, allowing private providers and in particular Independent Sector Treatment Centres (ISTCs) to perform procedures on NHS-funded patients (Naylor and Gregory 2009); and “targets” to reduce patients’ waiting times for both elective and emergency care. Working practices of GPs have changed, notably with the contract changes that allow them to opt out of providing direct “out-of-hours” services (Coast et al. 1998), and this may also have contributed to increased levels of admissions. The Nuffield Trust has produced several studies of elective and emergency activity levels separately. Recent work Blunt et al. 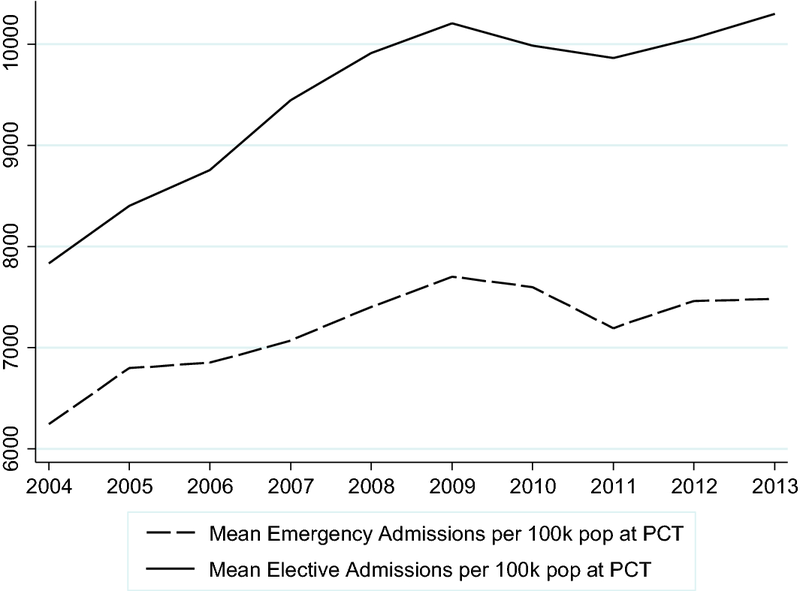 (2010) shows that the number of emergency admissions has been rising for some time, in part due to a reduction in the clinical threshold used when deciding to admit. Smith et al. (2014) show that elective admissions are increasing rapidly and that pressure on hospital resources is likely to continue into the next decade unless more efficient and innovative ways of treating patients can be implemented. Freeman et al. (2016) look jointly at emergency and elective care at an aggregate level, considering the impact of scale in both emergency and elective admissions on hospital unit costs using a large-scale panel dataset from English hospitals. They find that increasing elective admissions leads to higher costs for emergencies, but increasing emergency admissions does not increase costs for elective admissions. The consequences of issues such as “bed-blocking” are likely to be felt across hospitals regardless of whether they originate in emergency or elective care. In the short term, it is rarely possible to reduce the volume of emergency procedures so if systems are stretched beyond full capacity, the only solution is to delay elective operations. However, it is important to consider what could happen to patients and demand for health-care services in the long term if important elective procedures are delayed or not performed. We contribute to the literature by providing new evidence on this subject, and in particular what happens to aggregate levels of emergency care in small geographic areas when elective care changes. This important matter has not been well studied in the literature. One explanation for the lack of the literature studying the interaction between levels of emergency and elective care over a long time-frame is that it is difficult to identify causal relationships between changes in the two types of care because most shocks that affect demand and supply of health care will impact on both emergency and elective simultaneously. We attempt to overcome this issue by estimating dynamic fixed effects panel data models for emergency admissions at PCT (Primary Care Trust) and NHS Hospital Trust level, showing the impact of elective changes on future levels of emergency care, controlling for a group of area-specific characteristics and other secondary care variables. We also estimate a model of elective admission rates using emergency admissions as a dependent variable to identify causality. As a further check, we consider also the elective treatment of NHS patients by private providers. Privately owned organisations were encouraged to treat NHS-funded patients by innovations such as the creation of ISTCs in 2003, which provided guaranteed levels of income for operators over a fixed time, and furthermore by letting any private hospital treat NHS patients providing they were willing to do so for the nationally agreed tariff fee (Arora et al. 2013). 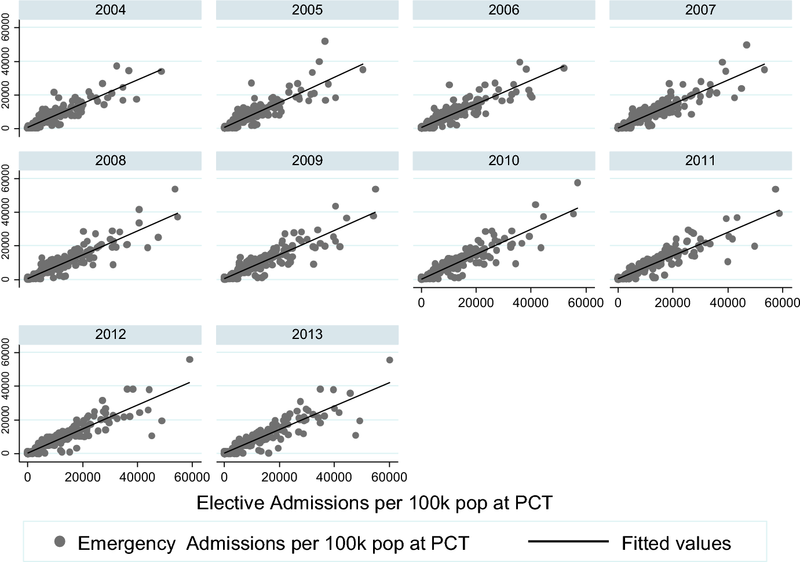 We find that lower levels of elective admission in a geographic area are associated with higher levels of emergency treatment in later years, with consistently negative coefficients on lagged elective admissions in all specifications of emergency admissions estimated. This effect is observed when local areas are measured at both Hospital Trust and PCT levels. In all specifications of emergency admissions, the coefficient of lagged emergencies is significant and positive at the one per cent level, showing that high rates of emergency admissions are a persistent problem across time for some areas. We also find that elective activity by private providers does not affect emergency admissions. Our study covers a time during which resources available for hospitals were growing with the increase in admissions and as such staff workloads are likely to have remained fairly constant. However, as the efficiency drives currently in place take effect, staff workloads are likely to increase, and increasing nurse-workloads have been found to increase the chance of patient mortality in US hospitals (Needleman et al. 2011). Evidence from Germany suggests that the increased risk occurs once occupation levels reach a certain threshold, when staff come under greater risk of making mistakes (Kuntz et al. 2014). In times of greater workload, lengths of stay for patients can increase (Jaeker and Tucker 2013; Batt and Terwiesch 2012), and these issues are likely to become more important in the NHS as pressure on resources grows. The rest of the paper is structured as follows. Section 2 shows how the provision of emergency and elective care is likely to respond to changes in policy and the incentives they place on hospital management and patients. Section 3 details the dataset, and then, Sect. 4 explains the approach used in the econometric analysis. Section 5 provides results. Section 6 discusses the policy implications and concludes. In this section, we briefly consider the processes by which changes in aggregate levels of elective provision could alter the levels of emergency care. Changes in elective activity could affect (1) the demand for emergency care from patients and/or (2) the supply of emergency care by hospitals. The demand for emergency care when elective supply changes will be affected differently depending on whether elective care and emergency care are substitutes or complements. Withholding an elective procedure may cause the patient’s condition to deteriorate to the stage where emergency treatment is required, and in this case, the two types of care are substitutes. For example, not performing an elective hip replacement may increase the likelihood of a patient suffering a fall, thus requiring emergency treatment. If the two types of hospital treatment are substitutes, increasing elective provision would mean less emergency treatment is required by patients. Alternatively, emergency and elective activity could be complements. This may be true if elective procedures cause complications for patients that later require emergency treatment. It is likely that both of these issues would take some time to become apparent and that we would expect to see a lag between the introduction of the elective supply shock and the impact on emergency activity. Elective and emergency treatments are likely to be substitutes for some conditions and complements for other conditions. As such, it is difficult to predict whether the aggregate demand for emergency care will go up or down as a consequence of increased elective provision. The policies introduced in the early years of the 2000s were designed to extract efficiency gains created by ensuring that hospitals operate in a market with some competitive pressures rather than one in which they had significant market power (Mays et al. 2011). Traditional economic theory proposes that profit maximising agents in a competitive market with two goods would attempt to equalise the marginal profit across the two goods, in this case emergency and elective health care—if not, profits could be increased by switching resources towards the provision of the more lucrative service. Even after the reforms, hospital managers are unlikely to fully act as profit maximisers, but there are aspects of the new health-care “market” that influence managers’ behaviour and make them increase provision of services that are more lucrative to their hospital. Thus, if additional resources are made available with the intention of increasing elective provision in hospitals, and hospital managers are acting as rational profit maximisers, it is likely that the thresholds for both emergency and elective admissions will be relaxed, with some of the additional resources made available for emergency admissions. This would mean that emergency and elective activity levels move in the same direction after a change in resources. However, as with demand side effects, these supply-side changes are likely to take some time to be fully implemented, and hence, we expect to see a time-lag between the elective supply shock and any impact on emergency activity. Most of the policies introduced in the NHS are likely to have caused positive supply shocks in elective care, but it is likely that some of the increased aggregate capacity will be used to provide more emergency treatment. It is not clear how patient demand will be affected, and therefore, whether emergency or elective activity in aggregate moves in the same or different direction is unclear. To model emergency activity at PCT and Trust level, we create a panel of variables covering treatment, demographics and supply-side factors for the years 2004–2013. The main source of data is Hospital Episode Statistics (HES), a database which provides information concerning all inpatients and outpatients treated by NHS hospitals from 1989 to 1990 onwards. It includes those resident outside England and private patients who were treated in NHS hospitals, and care delivered by Treatment Centres (including those in the independent sector). We consider all admissions, including day cases, for patients admitted as emergency or elective. We exclude maternity-related admissions. Each patient record contains detailed information about the admission, covering clinical issues and additional administrative data, plus patient characteristics such as age, location and gender. The dependent variable we estimate is the natural log of emergency admissions per one hundred thousand population at PCT and Trust level. Emergency and elective admissions are likely to depend on population morbidity, so it is important to control for prevalence of specific conditions. Unfortunately, in the UK complete information about the morbidity of patients is not publicly available. One set of measures commonly used in the literature comes from the Quality and Outcomes Framework (QOF), which provides valuable clinical information concerning prevalence for specific diseases3 that will influence the demand for hospital admissions. QOF is a system used to reward general practices for providing good quality care to their patients, and to help fund work intended to further improve the quality of health care delivered. Prevalence data are used within QOF to calculate points and payments for clinical domain areas, and provide a measure of the number of ill patients on the practice register as a proportion of the total number of patients registered at the practice. We focus on four conditions, namely stroke and transient ischaemic attack, chronic obstructive pulmonary disease (COPD), epilepsy and cancer, and use the raw prevalence rates in our analysis. These rates do not take account of differences between populations in terms of their age or gender profiles or other factors that can influence the prevalence of conditions. The data on prevalence of the clinical conditions are grouped at PCT level. The data cover almost all GP practices (around 9000) in England and are extracted from disease registers submitted to the national Quality Management and Analysis System (QMAS). We use Office of National Statistics (ONS) mid-year population estimates to calculate elective and emergency hospital admission rates. We also use ONS data on the percentage of the population by age (male population over 65; female population over 60)4 and gender. We also include measures that characterise the supply of NHS services, namely the number of specialists per one thousand population and the number of hospitals at PCT level. Furthermore, we also consider the impact of private providers performing elective procedures on NHS-funded patients on emergency admission levels. Table 1 provides a descriptive summary by year of the variables used in this study. This table contains data on four types of variable: activity data, prevalence of specific diseases, demographic data and variables intended to measure supply. Activity data show the dependent variable (emergency activity) and our main explanatory variables (elective activity in NHS hospitals and elective activity for NHS-funded patients by private providers). These series show that use of all three types of activity has increased markedly, with elective admissions in NHS hospitals per 1000 population increasing by approximately 31% and emergency by 20%. These data are also presented in Fig. 1. 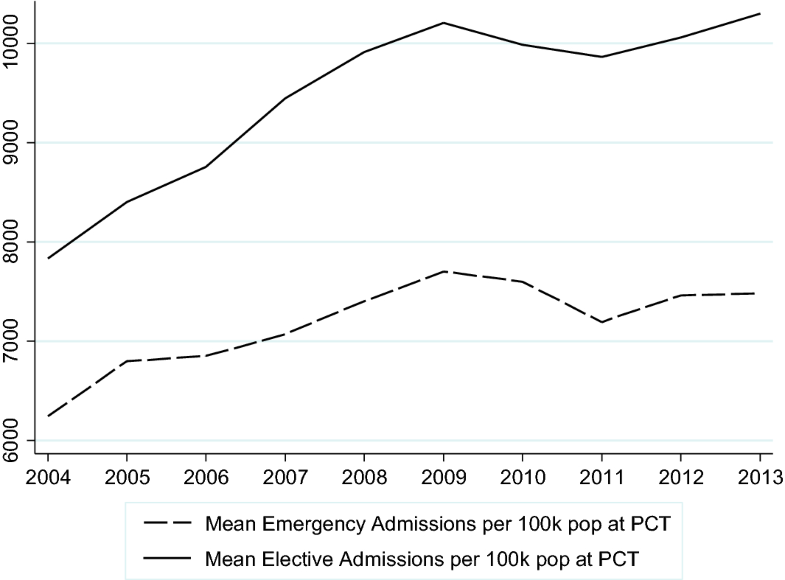 Both emergency and elective admissions saw significant increases from 2004 until 2009, but a growing population and pressure on resources saw this tendency decrease. Emergency admission rates peaked at 7702 in 2009 and, after 2 years of lower admissions, started to increase again at the end of our time-frame, to reach 7480 in 2013. Elective admissions followed a similar pattern but reached their highest levels in 2013 at 10,296 per 100,000 population. Emergency and elective admission rates at Trust level per 100,000 population, 2004–2013. 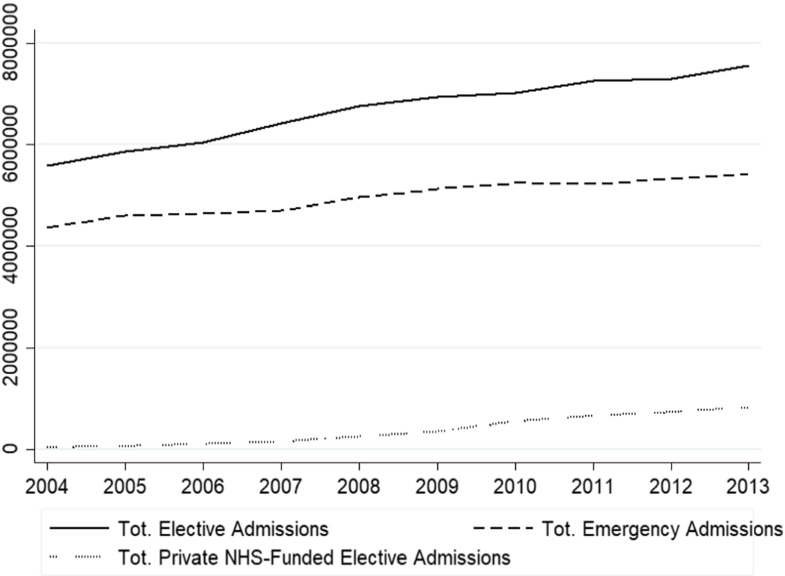 Figure 2 plots the aggregate levels of English emergency and elective admissions in NHS hospitals, plus NHS-funded admissions by private providers. It shows a consistent increase in elective admissions across the 10 years of our study. Emergency admissions grew at a slower rate. There was an upward trend in the number of patients seen at private providers, which is to be expected with a policy-driven innovation. A similar pattern was noted by Arora et al. (2013). Total emergency and elective admissions, 2004–2013. Our demographic variables are the proportion of the total population who are men aged 65+ or women aged 60+, and the proportion of women in the total population. We include these two age variables, which are published by the ONS, to give an indication of demand faced by health-care providers due to older local populations. All three of these series are generally consistent across our time frame, with the proportion of the population who are men aged 65+ around 6.8%, the proportion of the population who are women aged 60+ between 11.4 and 11.8% and the proportion of women in the population between 50.2 and 50.9%. We finally include variables intended to capture the supply of health care. The numbers of hospital sites and consultants per local resident, in addition to the average number of specialists per 1000 population and average number of hospitals per 1000 population, have all approximately doubled. Figure 3 presents a correlation of emergency and elective activity rates for every year included in this study. These charts, which control for the different sized populations in PCTs, suggest that the two series are positively correlated and that areas which experienced higher elective admission rates also had higher emergency admission rates. However, this is a simple correlation ignoring any other possible determinants, and as such, we now introduce a more robust empirical strategy to see if this correlation persists when other factors are taken into consideration. Correlation plot of emergency and elective activity by year. where Eit represents the number (in logs) of emergency admissions in (public) Trust i belonging to PCT j in each year t. Apart from the dynamic component, the key explanatory variables that capture elective admissions are the number (EL, in logs) of elective admissions in (public) Trust i and a function, G(INDSjt) of the number of NHS-funded elective admissions to private facilities in PCT j in year t. Xjt is a vector of socio-economic characteristics that are time-varying at PCT j in time t, including the local population percentages of genders, ages and diseases. To avoid the possibility of endogenous recording of conditions following hospital admission, we use prevalence data for year t − 1 for hospital admissions in year t. β is a vector of the coefficients of these variables. Suppjt is a matrix of variables that characterise supply-side aspects of health care for PCT j in year t. We include the per capita number of specialists as well as the per capita number of hospitals (see the descriptive statistics section for further details). Finally, we control for time with year effects (µt), PCT with fixed effects (σj) and εjt is a random error term which is assumed to be normally distributed with a variance that is allowed to vary across trusts. In order to specify the G function, we consider two specification options: (1) eLindsjt which represents the log number of elective admissions at NHS-funded for patients from PCT j in time t; and (2) a dummy variable ELDjt, which equals 1 if PCT j had any NHS-funded patients treated by a private provider in year t, and 0 if the PCT had no NHS-funded patients treated by a private provider that year. In addition to this, we allow for structural changes after the introduction of a private provider in a given PCT by interacting the (log) lagged emergencies, Eijt−1, and the (log) lagged elective admissions, ELijt−1, at the trust with the ELDj dummy. The results regarding the lagged variables at Trust level are very clear and stable across specifications, implying a clear dynamic effect. The coefficient of lagged emergencies is estimated between 0.47 and 0.58 and is always significant at the one per cent level. Alternatively, the (elasticity) coefficient of the lagged elective admissions is always found to be negative, between − 0.17 and − 0.26, but is only significant at the 10 per cent level. These values suggest that an additional hundred elective admissions in the previous year can be expected to reduce emergencies by between 17 and 26. In general, we do not find important (significant) direct effects of the variables related to the treatment of NHS-funded patients treated by private providers (the ELD dummy has the correct sign, but is significant at the 10 per cent level in just one specification; the eLinds variable is not significant). However, we find interesting effects of their interaction with the site level variables, although they are only significant in the specification in which they are not instrumented. In this specification, the estimated effects are found to partially (in the case of emergencies) or fully (in the case of elective care) balance the effects found in the specifications without interactions. That is, the interaction with the lagged emergencies is negative, partially compensating the dynamic coefficients, and the interaction with lagged electives is positive, practically compensating the dynamic component. In general, we find that the demographic variables have non-significant effects across all specifications. The coefficients of the supply factors have the expected signs. In particular, the hospital per capita variable is found significant in the non-instrumented interaction specifications [columns (2) and (5)]. As a placebo test, we have also estimated a model of elective admissions using emergency as an explanatory variable (see “Appendix 2” in Table 4). This test is performed to reject the hypothesis that increasing emergency admissions has no effect on elective admissions. We observe that the coefficient of emergency admissions is always negative in all of the specifications estimated but is never statistically significant. In this section, we evaluate the model at the PCT level. The results obtained regarding the key coefficients of the model at this level of aggregation will allow us to assess whether decisions are taken at the trust (hospital) or the PCT level. Table 3 shows the results for the estimated specifications of Eq. (2) using data aggregated at the PCT level. As in Table 2, the first three columns present results in which the effect of private provision is proxied with a dummy (ELD), while the rest present results using the per capita number of elective interventions (eLinds). Columns (1) and (4) present the basic specification with demographic and supply-side controls, while columns (2) and (3) (and 5 and 6) add interactions of the basic variables at the Trust Level (lagged emergencies and elective admissions) with the ELD dummy. As in the previous case, all specifications (with the exception of column 5) pass the standard dynamic panel specification test at the 5% confidence level. Aggregating the variables at the PCT level has strong implications for the results of the model. In the autoregressive part of the model, we find that only elective admissions are significant at the 5% level and have the expected sign. The implied elasticity is between − 0.13 and − 0.36. This means that hundred additional elective admissions in the previous year reduce emergencies by between 13 and 36. The coefficient of the lagged emergencies is not significant. However, a pseudo-Wald test cannot reject that the coefficients of elective admissions and lagged emergencies are equal to those estimated at the Trust level. This may imply that the relevant decision level is the Trust. Both of the variables related to the treatment of NHS-funded patients by private providers show the expected sign, but in neither case are they significant. The same happens with the interaction terms, which are not found to be significant in any specification. As in the previous specifications, the demographics coefficients are always non-significant. Finally, the supply factors are found to have the expected signs. As in the case with PCTs, the hospital per capita variable is the stronger factor, but is never found to be significant at the 5% level. In 2016/2017, the average unit cost for an elective inpatient admission was £3684; the average unit cost of a non-elective inpatient admission was £1590. If policy was successful in reducing elective admissions by 1% (from 7,555,200 to 7,479,648), this would lead to savings on elective care of approximately £278 m (£3684 × 75,552), but our estimates suggest that in this situation, emergency admissions would increase by between 13 and 36% of the decrease in elective admissions—between 9821 and 27,198. If admissions went up by 9821, then this would cost £16 m and if the increase was 21,198, then this would cost £43 m, thus reducing the savings to the NHS by between 5.6 and 15.5% of those accrued by reducing elective admissions. There is significant pressure on the NHS in England to control expenditure at a time when the public purse is being restricted. This is likely to impact on all aspects of health care, but particularly those elective treatments which are for conditions that are not life-threatening and can be delayed or withheld entirely if resources are severely limited. We find, using a panel data model for emergency admissions at PCT and Trust level, that there appears to be a negative relationship between elective activity within hospitals and future emergency activity—i.e. that changing levels of elective activity will likely lead to an opposite effort to the number of patients that require emergency treatment in the future. This presents a problem for policy makers, as it means cost-saving measures that target elective hospital care are unlikely to reap the benefits in aggregate that they had hoped for—our estimates suggest that any reduction to elective care could lead to increases in emergency spending of between 5.6 and 15.5% of the savings achieved by reducing elective care. It becomes increasingly important for practitioners and policy makers to be as efficient as possible, making sure that where possible patients are treated in primary care settings and focusing specialist referrals on to patients who stand to gain the most to limit the number who require emergency care. There are other factors to consider. The negative relationship between current levels of elective care and future levels of emergency activity that we observe in this research comes using data from a time when elective provision was generally increasing year on year. It does not necessarily follow that the same negative relationship will persist in the different circumstances associated with reducing elective activity. The concept of supply-induced demand (Evans 1974) where demand expands to fill the available capacity is a particular issue in health care and is one reason to be cautious about the generalisability of our conclusion. A second issue is that we only consider aggregate emergency and elective treatment. A more disaggregated study may be able to identify conditions or pathways in which reducing elective care will not create additional workload for emergency departments. Even without further work, the results presented here suggest that the NHS faces a complex problem and that efforts to reduce elective care are likely to have unanticipated consequences for other areas of the NHS that could require costly solutions. For more information of the administrative structure of the NHS, see “Appendix 1”. In 2013, twenty-two conditions were included in QOF. This is a widely used aggregation of the data provided by the Office of National Statistics and was in line with historical state-determined ages of retirement in the UK. In the literature, there are two standard estimators, namely the Arellano and Bond and the system estimator. The nature of our problem led us to prefer the first of these estimators. The variance matrix of the GMM-IV estimator accounts for the fact that the errors are autocorrelated and, accounting for the possibility of further heterogeneity, we apply the robust version of the variance of the GMM-IV estimator, following Arellano and Bond (1991) or Roodman (2006) suggestions. This explains why columns (3) and (6) have 14 extra over-identifying restrictions (instruments). When the error in levels is serially uncorrelated, first differencing induces first-order serial correlation in the first-differenced errors and not second-order serial correlation. The m1–m2 test (reported below each of the column) these assumptions. All the specifications considered pass these tests. Results from these experiments are not reported but are available upon request. We would like to thank Barry McCormick, Raphael Wittenberg, Martin Gaynor, Robert Anderson, Guisepe Moscelli and the delegates at the Conferences of Health Econometrics, Bergamo 2018, and Spatial Health Econometrics, York 2017, for their useful comments on drafts of this paper. Sergi Jiménez-Martín acknowledges partial financial support from the Spanish Ministry of Economy and Competitiveness under Grant ECO2014-52238-R and ECO2017-83668-R. This project was part funded by the National Institute for Health Research, Health Services and Delivery Research 11/1022: Demand management for planned care. Sergi Jiménez-Martín declares that he has no conflict of interest. Stuart Redding declares that he has no conflict of interest. Catia Nicodemo declares that she has no conflict of interest. This article does not contain any studies with animals performed by any of the authors. This article does not contain any studies with human participants or animals performed by any of the authors. At the time this analysis was performed, the main organisations responsible for the commissioning and providing of secondary care in the NHS were Strategic Health Authorities (SHAs), Primary Care Trusts (PCTs) and Hospital Trusts (including Foundation Trusts). SHAs were in operation between 2002 and 2013, with their main role to implement policies as directed by the Department of Health. PCTS were the lead administrative organisations in the NHS. They were provided with budgets from the Department of Health to commission hospital services and mental health services, and to fund general practitioners. They were responsible for the vast majority of NHS spending. Hospital Trusts are the providers of secondary care in the NHS and are commissioned to do so by PCTs. Traditionally, Hospital Trusts were directly accountable to the NHS, but Hospital Trusts were encouraged to gain Foundation Trust status in a process started by the Health and Social Care (Community Health and Standards) Act 2003. Hospitals that met certain standards were allowed to have more flexibility in their governance structures and were given increased freedom to operate with less supervision from the Department of Health and also the ability to raise money from non-NHS patients. The analysis presented in this paper took place before the reforms introduced in the Health and Social Care Act 2012, which came into effect on April 1, 2013. This replaced Primary Care Trusts with Clinical Commissioning Groups, GP-led organisations that commission hospital services in line with their patients’ needs.